A parent node in a graph database can have many child nodes. In addition to the many children, there can be many distinct and different paths to each single child node. 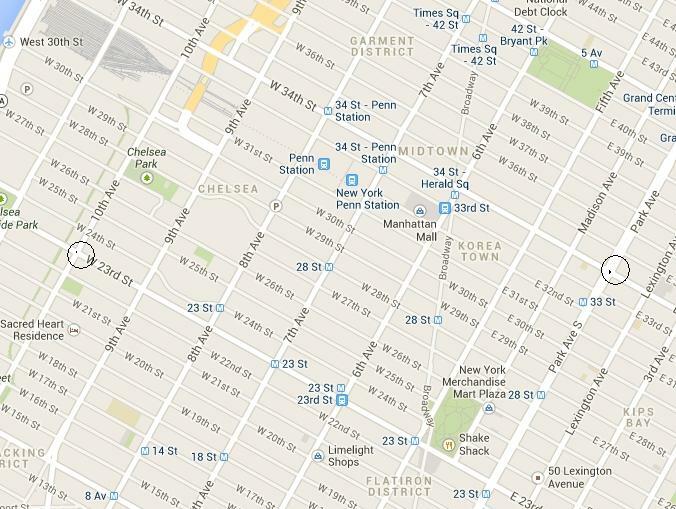 An example of multiple paths to the same destination is to look at a subsection of Manhattan. How many ways are there to get from the intersection of West 23rd Street and Tenth Avene, to East 34th Street and Park Avenue South? You could do only one turn: go north, and turn west. Or go west and turn north. Or you could do many turns, zig-zagging your way through the streets on the grid. And those would just be the shortest paths. You could also take the long way, zig zag all the way to the south of Manhattan, and take a site seeing tour back north. By contrast, if there is only one country road, there is often only one way to get from point A to point B. The more nodes and connections there are, the more the possible paths there are between nodes. As I pointed out in my last post, https://rodgersnotes.wordpress.com/2013/08/12/using-neo4j-to-find-all-parents-child-paths/ the number of paths in a graph, can be many multiples more than the number of nodes, or relationships. So, given a parent node, finding the distinct set of children can give odd results. Here are some pitfalls to be aware of. The structure for Oracle objects is a tree structure. Not a table structure in rows and columns. In another post, there is a query I wrote to show object dependencies. DBA_DEPENDENCIES will show the object’s parents. Or the children. But only one level up, or down. Trying to see the tree structure using SQL queries is problematic. The reason being, the output from SQL is not a tree at all. And, as I wrote before, the very same object can be seen multiple times in the output. Recently, I’ve been using the graph database, NEO4J. It is perfectly suited to create tree structures and store them in a database. In Oracle 11.2, I snagged the data from DBA_OBJECTS and DBA_DEPENDENCIES, created Cypher commands to insert the nodes into NEO4J, and created the relationships/vertexes between the nodes. 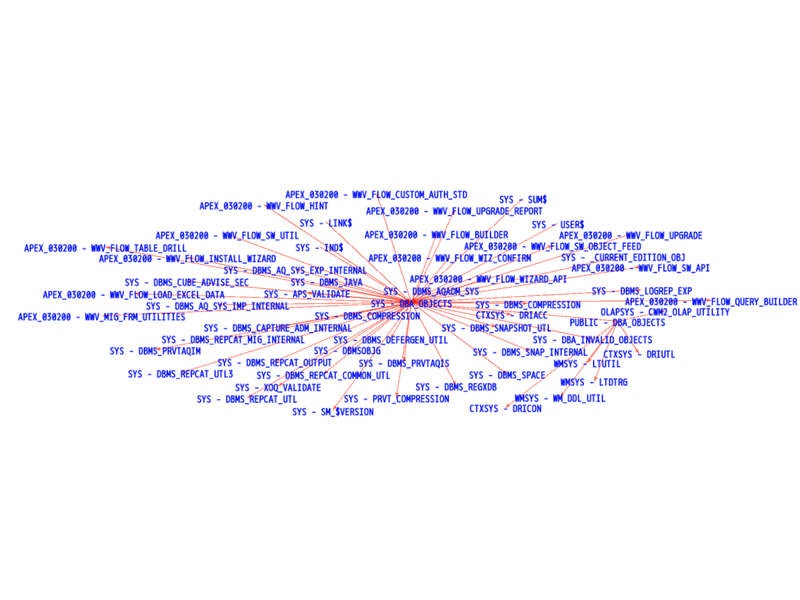 Then I used Gephi to visualize the graph with different layouts. See some different output. All the parents and children of the View, SYS.DBA_OBJECTS, and the Synonym, PUBLIC.DBA_OBJECTS.